In 1942, 270 Jews from the village of Dolhinov, Belarus, fled from Nazi persecution. Now their bravery and fortitude is being commemorated by a new facility for teaching about nature at Tel Aviv University’s Botanic Gardens. A signing ceremony was held in honor of the Dolhinov Jewish community's generous donation of an outdoor classroom memorializing 5,000 members who fell victim to the Nazis and their collaborators. Representing the community was Leon Rubin, himself a Dolhinov survivor, who expressed great pride in the future impact of the project. The classroom will be used by thousands of visitors to the Botanic Gardens in the coming years. Along with Mr. Rubin, participants in the ceremony included TAU President Joseph Klafter; Botanic Gardens Director Dr. Yuval Sapir; and over a dozen members of the Dolhinov community and their descendants, three of whom teach at TAU. 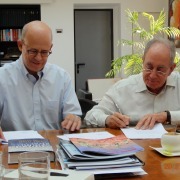 President Klafter said, “This donation connects TAU’s standing as an Israeli and Jewish institution on the one hand, with the University’s public mission of outreach and community education on the other.” Prof. Colin Price of TAU's Department of Geophysical, Atmospheric and Planetary Sciences and his brother, TAU architecture lecturer Dan Price, whose father was a Dolhinov survivor, were instrumental in connecting the donors to the University. 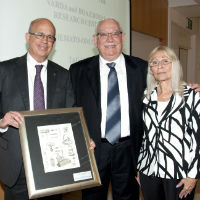 Donating to the Botanic Gardens at Israel’s largest university has special meaning for the Dolhinov community. During the final months of 1942 the 270 community members fled from the Jewish ghetto to the forests, joined the partisans, and began an exhausting march over 1,500 kilometers through wooded occupied territory. Walking only at night, eventually they crossed the German-Russian frontier and found safety deep into Russia. They are indebted for their survival to Russian officer and partisan Nikoli Kiselev, who escorted the group over a two-month period. Of the 270 Jews who fled, 218 members of the community survived. Kiselev would later be honored as a Righteous Gentile by Yad Vashem for his courageous and heroic efforts.